The DHW boiler is manufactured in S 235 JR steel according to standard DIN 4753. 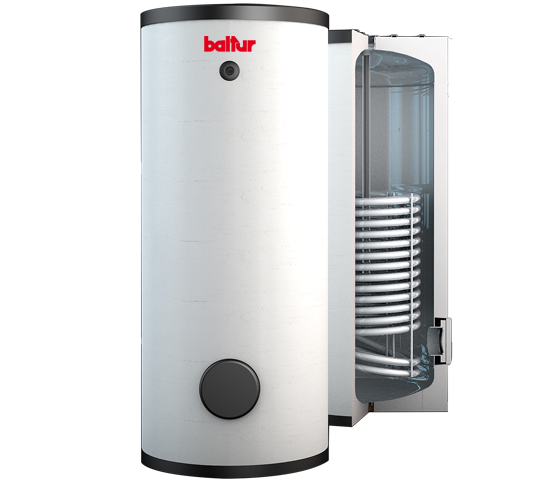 This boiler, equipped with a high surface exchanger, is specifically designed to be used with heat pumps. It can also be used as a high performance boiler if powered by conventional generators, such as biofuel, gas or diesel boilers. Its inside is glazed according to DIN 4753-3 and is further protected by the magnesium anode. 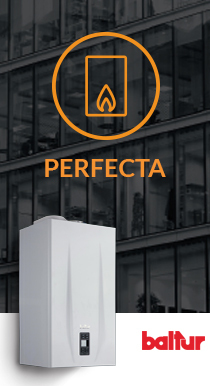 200-litre and 600-litre models: It is made up of 50 mm directly injected rigid polyurethane, free from chlorofluorocarbons (CFC), covered by a RAL 9010 PVC casing. 800-litre and 1000-litre models: It is made up of 95 mm directly rigid polyurethane, free from chlorofluorocarbons (CFC), covered by a RAL 9010 PVC casing. 200-litre and 600-litre models: The flange, with ø 180 mm, allows the insertion of a resistor for the heating of the water. 800-litre and 1000-litre models: The flange, with ø 290 mm, allows the insertion of a resistor by means of a reducer.